Nice'n Easy Demi-Permanent Hair Colour gives you a natural & healthy-looking colour result. Ideal for first time colourers, its special system, with Aloe Vera and oils, leaves no visible root line, as the colour will gradually wash away. So no long-term commitment! Q. Is Nice ‘N Easy No Ammonia Right For Me? A. Nice'n Easy No Ammonia will give you a natural & healthy-looking colour result. A: It's so easy to use & takes only 15 minutes - just apply, leave on for 15 minutes, then rinse out. Nice ‘n Easy No Ammonia Crème Colourant wraps each hair with rich natural looking colour. The special conditioner included in the box helps seal the colour in, and leaves your hair soft and shiny. Q. Will It Cover My Grey? A. Yes! Nice ‘n Easy No Ammonia beautifully enriches your own natural hair colour and blends away grey in just 15 minutes! Q. How Long Will My Colour Last? A. Nice ‘n Easy No Ammonia gradually washes away in about 24 shampoos. If you select a shade that is darker than your natural hair colour, it may take longer to fully wash out. 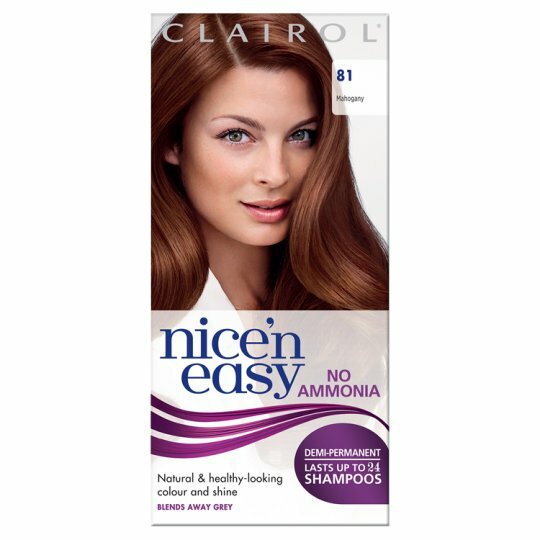 If you'd like to lighten or dramatically change your hair colour try Nice ‘n Easy permanent hair colour or Nice'n Easy AgeDefy, all from Clairol. Do not colour your hair if: - you have a rash on your face or sensitive, irritated and damaged scalp, - you have ever experienced any reaction after colouring your hair, - you have experienced a reaction to a temporary "Black Henna" tattoo in the past. In case of any reaction or when in doubt consult a doctor before using any hair colour product. Do not use to dye eyelashes or eyebrows. Rinse hair well after application. Avoid contact with eyes. Rinse eyes immediately if product comes into contact with them. Wear suitable gloves. Keep out of reach of children. This product is not intended for use on persons under the age of 16. Temporary 'black henna' tattoos may increase your risk of allergy. Perform allergy alert test 48 hours before use.